With an innovative new type of receiver, called Apertif, the field of view of the Westerbork Synthesis Radio Telescope in the Netherlands has been increased 37 times. Apertif, developed by the Netherlands Institute for Radio Astronomy (NWO Institute ASTRON), will be officially opened today, on 13 September 2018 by deputy Cees Bijl of the Drenthe province. Today the 50-year anniversary of the telescope will also be celebrated. 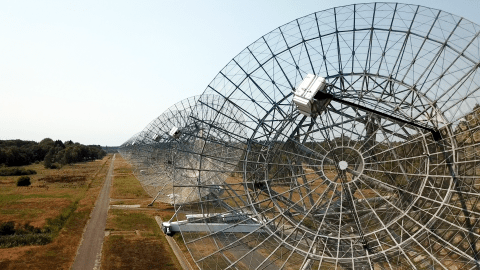 The iconic 50-year old Westerbork Synthesis Radio Telescope (WSRT) has been upgraded with a new high-speed, wide-field radio camera called Apertif. Using a technique called beamforming, 12 of the 14 dishes are now able to map a part of the sky that is 37 times larger than before. Apertif is also a pathfinder of the Square Kilometre Array (SKA), the future largest and most sensitive radio telescope in the world, recognised by the SKA project. Apertif will map a big part of the northern sky to make radio images of the neutral hydrogen gas in the Universe, providing a unique and new view of the properties and distribution of gas in galaxies. It will also look at a smaller part of the sky in much more detail, giving us a sharper picture of very faint, nearby galaxies, as well as galaxies in the very distant Universe. These two surveys will lead to new insights into the formation and evolution of galaxies. The collected data will be used by future researchers for decades to come. The upgraded telescope will also search for the most powerful explosions in the Universe, called Fast Radio Bursts (FRBs). The origin and nature of these extremely bright flashes of radio light, that travel billions of light years to reach Earth, are still largely a mystery. Because the flashes last only a fraction of a second, they are very easy to miss and difficult to observe. This is going to change with Apertif, which will continuously make a high-speed movie of the radio sky that will be analysed by the most powerful GPU-supercomputer in the Netherlands. The upgrade of Westerbork has been an institute-wide effort for ASTRON. "To develop a complex instrument such as Apertif, many people from multiple disciplines have to collaborate closely," says project leader Agnes Mika. "That’s why engineers from different departments have been working together in one room for more than a year. This improved the communication and problem-solving significantly. I am very proud of the whole team, and happy to see Apertif become operational." For more information, please visit the ASTRON website.